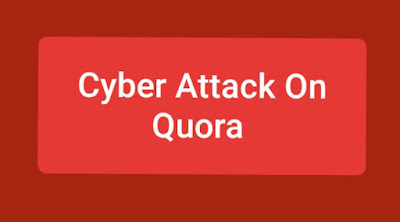 The questioning website Quora has recently suffered from cyber attacks in which data of about 10 million people has been stolen. Quora's CEO Adam Di Angelo wrote a blog post. In this post, he told that a hackers reached their system and steals people's data. The company had detected the cyber attack on November 30 after which the matter was started. CEO Adam Di Angelo said that our internal security team is working on this. And our team inform the people via email whose accounts has been affected. What type of information did hackers steal? Account Information: Name, Email Address, Encrypted Password. 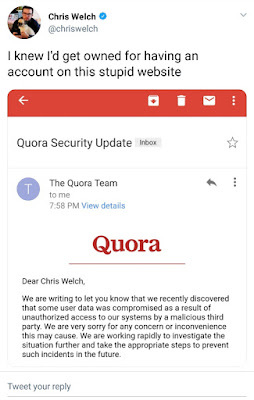 According to the company, Quora users change their account password to avoid such data theft. Apart from this, users can also delete their account. But while deleting the account, keep in mind that it takes 14 days for the account to be deleted. If you have logged in again this time, your account will be activated again.